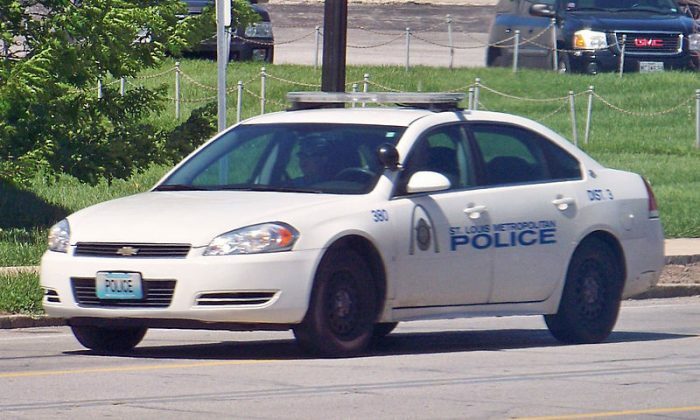 A St. Louis woman alleges police cruiser knocked a rear view mirror off her car and took off. The officer denied it, but the woman had a video to back up her claim. Danielle Allen said the officer sideswiped her 2004 Nissan Maxima on July 26 at 2:49 a.m.
“My car was parked legally in front of my house and a police officer sideswiped it, stopped, circled the block a few times, and pretty much hit-and-run and left the scene of an accident,” Allen told Fox 2. She said she wouldn’t have known who did it if not for her security cameras recording the area around the house. “We reviewed the cameras, a good six hours’ worth, and noticed the police officer was the only one to come that close and [make] contact with in my vehicle,” she said. Allen then turned to the media. A Fox 2 reporter contacted the police and the City Counselor’s Office and asked if they’d seen the video. He was told they would review the case. A day later, the office responded, saying the officer was responsible and Allen will be compensated for $2,400 in damages. It is not clear if the officer faces any disciplinary action. The police department hasn’t immediately responded to a request for a comment. Police union contracts require an “extremely burdensome administrative process for punishing/terminating officers, or requiring arbitration before they can be fired,” said Adam Bates, criminal justice policy analyst with the libertarian Cato Institute, in a response to an earlier inquiry.